Another fabric stash item. This time I barely had enough of what I wanted to use to squeak out a cute pattern from the 1960s. I wanted to use the left-over coral rayon blend linen look fabric I had from Simplicity 5267. I had some fabric still from Vogue 8728 for the facings. So my neckline facing is in two colors. I actually had to make a back bottom hem facing because I didn’t realize that the back hem was turned under hem. I didn’t want to lose length on my blouse so I made the facing for the back to match the front. I think it is so fun to sew up something that probably hasn’t been in a years. Sort of recreating the past. Also, since vintage patterns only came with one size in the envelope, it allows me to practice fitting more. Anyways, the cute bow at the bottom just sealed the deal on the pattern. I knew I had to get it and try it out. I wasn’t sure about what to do for the sleeves. I wasn’t certain if I had enough fabric for the sleeves to start with, if the sleeves would fit me better, and even if I wanted to have sleeves at all on the top. I tried the muslin with the sleeve on it. It was a little tight under the arm. 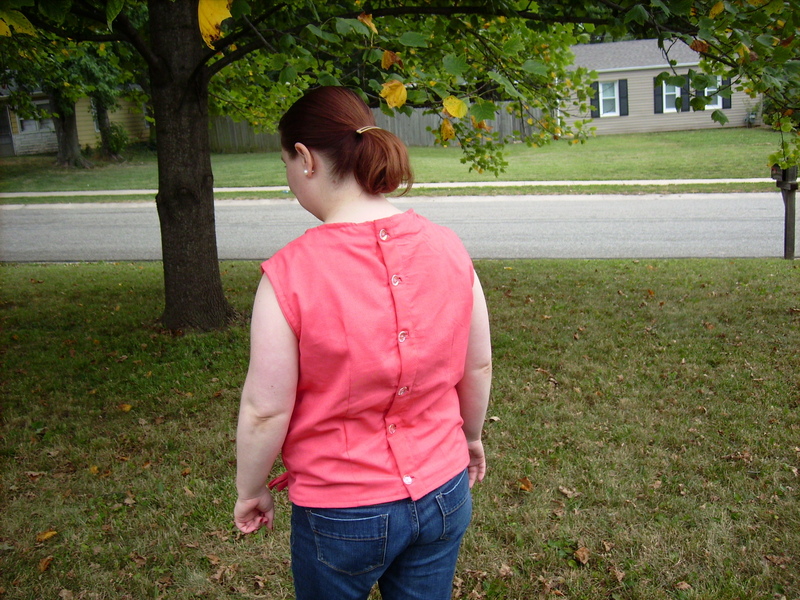 After my coral top was mostly together, I pinned the back together to be able to try it on and decide what to do. In the end, I decided the best use of my leftover fabric was to make self bias pieces to trim the arm scythe with. Buttons were the last step. I had wanted to get the button holes completed quickly. The instructions included steps for bound button holes, but when I was reading it over, it did sound complicated. I decided to use machine stitched button holes but neither machine wanted to cooperate and make a machine stitched button-hole. So frustrating. I was on the verge of having to put pearl snaps in until I remembered about Ami’s bound button-hole tutorial over on the Little Tailoress. 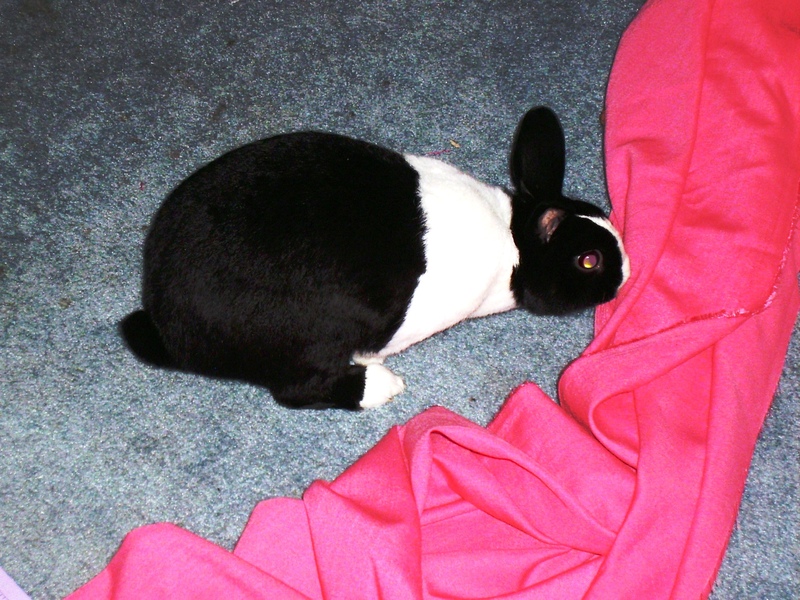 I have foiled the sewing machine button-hole strike at my house. While having foiled the sewing machine button-hole strike, my bound button holes are awkward looking. The pearl snaps would probably been put in better. I will have to practice my bound button holes because one of my future projects is a dress made from vintage Simplicity 5822 in silk. I do love my new top but I realize that it probably isn’t the most modern looking item I have made. The back button is old-fashioned. Not everyone is going to want to make this top even for the bow. I am not exactly sure what modifications could be made to make it more modern besides changing the neckline and not lose the overall character of the blouse. However, I can see this top lending itself well to the color-blocking trend. The princess side panels can be different from the front. But the back would need to be re-drafted to move the closure from the center back (so it won’t interfer with the blocking) and to put in side back panels.